Royal Excursion is a locally owned and operated company. Founded in 1998, Royal Excursion focuses its service on quality, loyalty, and honesty. We strive to continuously offer our customers first class service at low cost prices. Our mission is to provide high quality customer service, safety, reliability, and valuable charter tours, limousine rental, car service, and other transportation services to our community. The Royal Excursion fleet is consistently maintained, inspected, and updated for your safety and comfort. We offer modern equipment so you are assured to be in only the best. Each vehicle carries $5 million liability coverage. Your group will be impressed with our top of the line deluxe coaches and limousines. Our drivers and staff are well-trained and fully licensed to assure complete satisfaction and safety. Your group can be confident with the extra steps we take on each trip. In addition to being at your service for the duration, your driver will be courteous and knowledgeable to make your trip with Royal Excursion memorable. Customer service, quality equipment, and professional well-trained drivers are just a few of the ways we strive to achieve success. We demand high standards of our equipment and staff to assure the most pleasant experience possible with Royal Excursion. As always, we value your comments on our bus charter service. Thank you for choosing Royal Excursion for your bus tour needs. 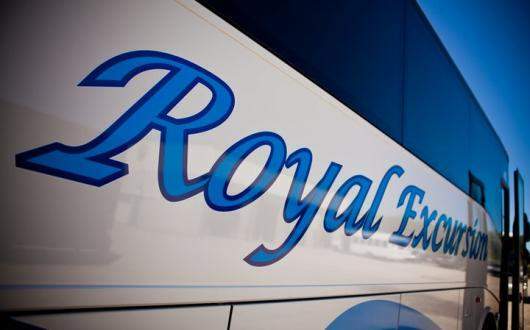 Royal Excursion is pleased to announce they have grown their customer reach considerably by acquiring Excursions Trailways, a Ft. Wayne, IN-based premium charter bus company. Excursions Trailways travels throughout the United States and Canada from its locations in Ft. Wayne, IN and Ottawa, Ohio. To download a PDF of our press release announcement, please click here.